Some of the lectures I attend at Falmouth School of Art can sometimes be a bit of a trial. This last one of the term, given by Krijn de Koning’s was definitely was not in that category. Engaging and fluent Koning gave us a full and informative insight into his fantastical world of architectural labyrinths. His career which has blossomed from transitioning drawings into impressive 3D sculptures was inspired by Malevich’s Black Square. A prime example suprematism, Krijn de Koning has used the same principles of the movement to go one step beyond the canvas, creating beautiful architectural forms. His sculptures are highly interactive, purposefully designed to change the visitor’s experience whether you are on the outside looking in or the inside looking out. His works within a building are solely aimed at redirecting attention by altering the spaces within the area he is working with. His imaginative pathways are usually full of colour, which he admits are employed out of instinct, but that is always mindful of their significance and psychological effect. The brutal colours of his early work have given way to more subtle usage, as his work has evolved. Koning delighted attendees from the fine art courses with the news that although he constructed most of his early pieces himself, contractors or volunteers now step in to do the heavy work, with an architect or engineer overseeing the technicality of erecting some of his larger structures. He confessed to being not completely immune to getting stuck in when the need arises, often helping to deconstruct the pieces so the materials can be recycled for other artists to make use of. Krijn de Koning’s most recent project, Volumes and Voids, was constructed within a bunker at the LiFE cultural centre, a former submarine base in Saint Nazaire, France. 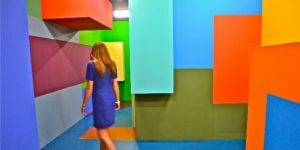 This life-size labyrinthine sculpture, allows visitors to journey into a world where colour is used to blur the boundary of reality and fiction. A significant reminder of his ability for deep abstract thinking. Koning was the 2007 recipient of the Sikkens Prize; a prestigious award made every few years for extraordinary contribution to the field of colour. Past recipients include Donald Judd, Bridget Riley and Le Corbusier.